I have enjoyed many shows over the years from serious dramas, to classic sitcoms, or political theatre. However there is one show that I have enjoyed more than any other, and I honestly doubt I will enjoy any other just as much. That show is Stargate SG-1. For those who don’t know Stargate SG-1 is a show that followed a team of military and civilian explorers of the U.S Air Force’s Stargate Command travel throughout the galaxy as they primarily sought to find weapons and technology to defend themselves against the tyrannical parasitic alien Goa’uld. Over the course of 10 seasons we saw this originally fledgling organisation go from underdog to galactic superpower while having to deal with new foes, petty politics, and complicated alliances. The reason why I place this show so high may seem strange. It doesn’t deal with serious issues to the same quality as something like Battlestar Galactica, dramas such as Breaking Bad have much better scripts, and other genre shows like Game of Thrones have much better set design. The show had shoddy set design at times where every cave was the same sound stage, the villains and style looked incredibly campy, and there were obvious ‘because script’ items such as how long a Stargate is active for or the fact everyone speaks English even if they write in some bizarre old Earth or completely alien language. If this was any other generic show this mix of items would render it to a fate of being cancelled after a season or two due to it being so middling. 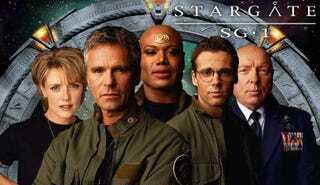 Stargate SG-1 however had a quality that most other shows lacked that made it so good. This was a show that routinely made jokes and digs at itself over past events, such as in an episode where Jack O’Neill was returned to being a teenager they listed over bizarre ‘strange events’ that had happened such as him becoming incredibly old, turning into a caveman, and swapping bodies with the rest of the team. It also never tried to pretend it was somehow writing Shakespeare and would almost wink at fans at times, such as when during a plan that was a homage to the Death Star attack from A New Hope everyone (including the normally reserved Tok’ra) in the briefing room raised their hands when asked if anyone thought it was a stupid idea. It even had two celebratory episodes that were dedicated to an obvious parody version of the show itself. This sort of genre-blending was very common throughout the show. At times it was hard to work out whether it was a straight-faced Sci-Fi show like Star Trek, a sitcom based in a Sci-Fi world like Red Dwarf, or a satire of Sci-Fi shows itself, even switching between different genres in a single episode, such as the much-loved classic Window of Opportunity where it went from an incredibly funny series of scenes, including using the Stargate as a driving range, to a serious speech about the fact that going back in time to relive life with a now dead loved one would only cause heartbreak. With the previous descriptions it might sound like the characters would be bland and uninteresting but you would be wrong. In reality they were brilliantly crafted, each having an easy to see role in the show but underneath had rich backstories and continued to grow over the course of the series as they were thrown into uncomfortable situations and forced to make difficult decisions. The characters at the center of this were obviously the members of SG-1 itself; Colonel (later General) Jack O’Neill, Captain (later Major) Samantha Carter, outspoken archaeologist Daniel Jackson, and the former First Prime of the Goa’uld Apophis, Teal’c of Chulak. Each of them fulfilled stereotypical group roles; the tough and charismatic team leader, the scientist who was more at home in the lab than in the outside world, the diplomat who tried to avoid violence, and the outsider who provided an alien perspective. Beyond these roles however they were each unique in their own way with their own strengths and weaknesses and all had their crosses to bear, such as O’Neill coping with his son’s death and his role in it, Carter’s poor relationship with her father, Daniel’s wife being kidnapped and his work being ridiculed by the wider scientific community, and Teal’c having to live with the acts he committed while in the service of Apophis. They moved forward though the show each having to deal with new roles of responsibility, such as O’Neill and Carter having to deal with the growing responsibilities of both command and being Earth’s representatives on other worlds (while also growing romantic feelings for each other), Daniel having to cope with his time as an ascended being, and Teal’c, labelled as the Shol’va, who was first seen as a traitor before slowly becoming a hero to his people as they sought freedom from the Goa’uld. As a group however they were at their best. Unlike some other shows where interactions could feel forced the actors in this show had chemistry with each other right from the get go that fed through into their characters. One of the best parts of the show was watching the brotherly relationship of O’Neill and Teal’c that grew over the years, watching Carter having to dumb down large concepts for the others to understand, or watching O’Neill and Daniel’s banter and antics over the years as Daniel made subtle digs at O’Neill’s childishness and O’Neill gently mocked Daniel’s democratic ways. Even the later characters of Vala Mal Doran and Cameron Mitchell fit into the team with time, with Vala acting as a foil (and cause of possible psychosis) for Jackson, and Mitchell having to integrate into a group of legends while leading them purely due to his military rank. Other characters on the base, some of whom were originally just in the background, also became a running gag, such as Siler (the chief engineer), who always ending up in the path of electrical surges or other explosions that sent him flying, and Walter Harriman, who frequently talked up his job (which was essentially dialing the Stargate and opening/closing the Iris) to others as being ‘rewarding’ even though it was incredibly dull. While I have to highly commend Brad Wright and Jonathan Glassner for creating and running the show for its length there is one person in particular who was the driving force behind the show’s success and that is Richard Dean Anderson. Not only did he bring his star power to the show, after being MacGyver for several years, but his brand of dry wit became a strong identity in the show that quickly became a common thread throughout many of the characters and situations in the series, with his comment that every planet looks very green (due to the show being filmed in Vancouver) being one of the earlier digs at the show itself. It was this that really set the show apart from others at the time and made it stand out as one of the best shows around. Overall Stargate SG-1 was a show that managed to brilliantly balance being dumb and campy along with being thoughtful and serious in a way few shows have and stood out at a time when both real life and TV was becoming increasingly dark and serious, a trend that has continued to this day. It may not have been excellence or genre-defining in any specific category but it never tried to be, rather the mix of brilliance itself was what made it so great. I don’t think a show will ever live up to its legacy for me and honestly I don’t want one to do so.